The Changeover is USTA Southwest's online feature series with players, volunteers, coaches and others who are doing great things in our community. This month's featured person is 13-year-old Adam Oscislawski of Scottsdale. 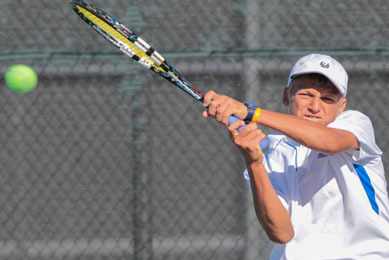 Oscislawski has had some terrific resutls of late, winning the Phoenix Junior Open in Boys 14s singles and recently reached the Round of 16 at the Easter Bowl in that same division. We caught up with Adam, a Jersey native who moved to Phoenix in September of last year, to get the lowdown on his tennis game. USTASW: You are relatively new to our section. When did you move here and from where? AO: I moved here in the beginning of September 2013 all the way from Princeton, New Jersey because my dad started a new job here in Phoenix, Arizona. USTASW: Did you play any other sports when you were younger? AO: Soccer was my primary sport when I was younger. I played as a midfielder for the Hopewell Galaxy travel team from about the age of 8. I stopped playing at the age of 12 because my mom was getting overwhelmed driving me to compete for both sports. USTASW: What age were you when you started playing tennis? How did you get started in tennis? AO: I picked up a tennis racquet for the first time around 7 years old. When I was younger, tennis was a fun game for me just like all the others sports I enjoyed playing, like soccer and basketball. I didn’t play my first USTA tournament until I was about 10. My dad plays tennis and he got me started so that when I got older he could have a good hitting partner for exercise. We still go out to play whenever there is a chance. AO: My ultimate goal in tennis is to strive to be the best that I can be, and hopefully that will give me a chance to be one of the best players for my generation. Ultimately my dream is to play professional tennis if that’s where my best can take me in the future. USTASW: Who is your private coach? AO: Before I moved to Arizona, Marc Hill was my private coach in Princeton for almost 2 years. He was a great coach and helped me make my initial big move up the rankings. When we moved to AZ, it took us a several months to try and find a training situation that worked for both for me and my family. Pro Jason Gerardo (The Phoenician Resort) helped me out a lot by always being available to jump in and work with me personally or to set up match plays for me. In late January, we were able to get a hold of Lou Belken who then agreed to coach me and work with me. In the beginning, I was kind of nervous to work with Lou, but he has really taken my game to another level with the technical and tactical stuff we are working on. I also recently met Jeremy Coll and his travel team and have been training and traveling with his group. This has given me a lot of really good built-in practice time with really great players, including Jeremy. I also like traveling and hanging out with the kids in this group because they work really hard like me, but also like to have fun. USTASW: You went to a national development camp in Maryland earlier this year. How was the experience? Did the coaches recommend you work on anything to build your game to the next level? AO: Going down to Maryland earlier this month was a lot of fun, and worthwhile. When I arrived at the camp, I was able to play matches against some of the best players in the country. I got a chance to see how other players conduct themselves mentally and physically. The coaches were very supportive and helpful. They provided me with useful information that helped me in Maryland and other tournaments I played after that. They told me that I was a great player and a hard worker. They also said that with more experience, I will start adjusting and getting used to other players games. I also got a lot of really helpful pointers from my coach Lou Belken who traveled with me to this training camp. USTASW: What have been your best tournament results thus far? AO: So far I think that my best tournament result while living in Arizona was getting past the qualifying rounds and winning my first main draw match before losing to Brian Cernoch 6-4 7-5 at International Spring Championships. Even though I didn’t win that match or the tournament, it gave me a lot of confidence which carried on to USTA Easter Bowl. USTASW: How did you enjoy competing at the Easter Bowl? What was your favorite moment at this tournament? AO: Easter Bowl has been my favorite tournament so far because of all the great players in the draw and the location of the tournament. Going to the Indian Wells grounds to practice was exciting and made me feel like an actual pro practicing! In this tournament my favorite moment was probably defeating the number 3 seed 6-4 6-2 because it boosted my confidence and proved to me that I have improved a lot over the last year and am starting to hang toe-to-toe with very good players. USTASW: In five years, if you played Rafael Nadal, what would the score be in a best of 5 set match? AO: It would be a dream to even play one of the best if not the best player of all time. I honestly don’t know what the result would be. All I can do is focus on the present and focus on continuing to get better. Only then would I even have an opportunity to play such a great player like Nadal.